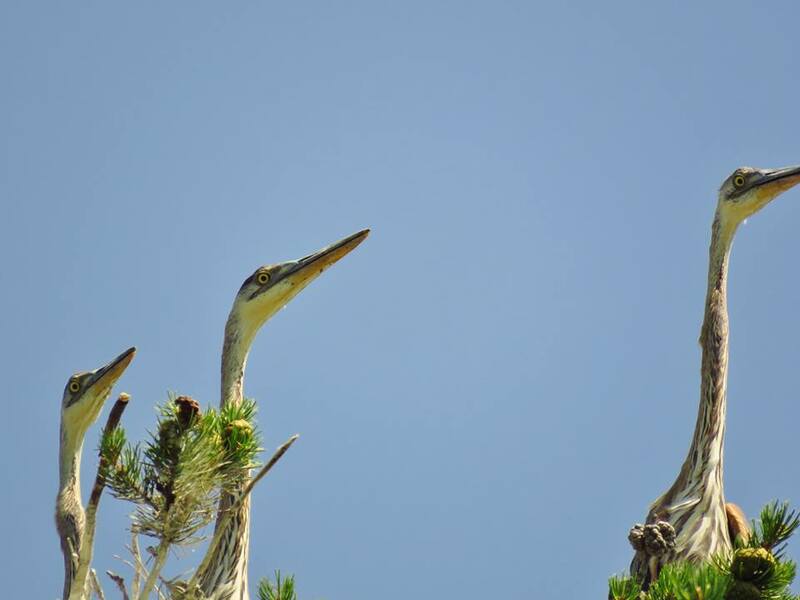 A female young of the year great blue heron (Ardea herodias), found dead last fall in the region of St. Jerome, was submitted to the CWHC – Quebec for examination. This bird was in very poor body condition which is not an uncommon issue in young birds from this species. Fledging great blue herons are weaned relatively abruptly by their parents at the end of the summer. They do have a short window of time to become efficient predators before they have to migrate. Because of this, the post-fledging mortality rate is quite high in this species. 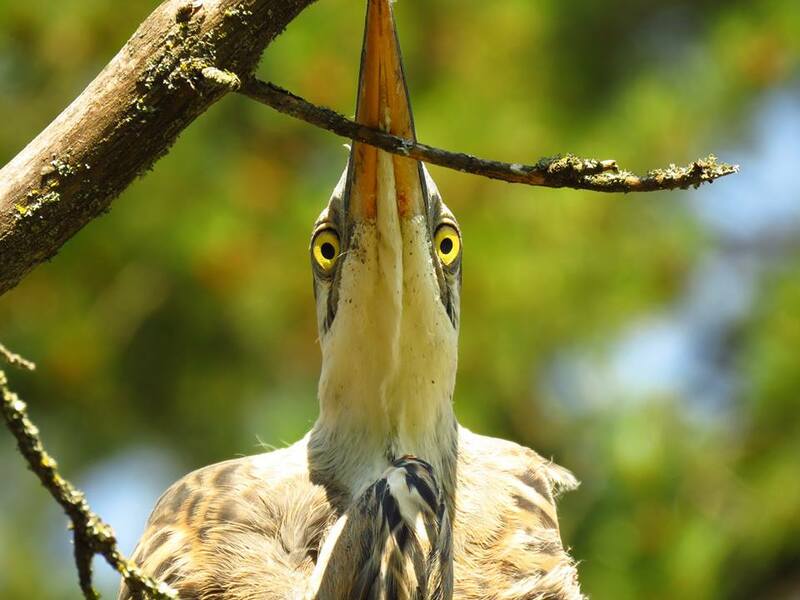 Starvation, without any other predisposing disease, is one of the most common cause of mortality documented in great blue heron submitted to our regional center. Indeed, primary starvation was determined to be the cause of mortality in 26% of the 297 great blue herons submitted to our lab since 1993. An unusual finding was also present in this bird: a whole adult American toad (Anaxyrus americanus) was present in the lumen of its esophagus. This prey is quite unusual for great blue herons based on our experience (no documentation of toad predation by great blue heron in the CWHC National Database). Actually, even if some authors suggest that great blue herons do eat toads, very few observations of predations on this species have been documented. American toad. Photo Credit: SE Fisher. The great blue heron’s diet consists primarily of fish, as well as frogs, small mammals, small birds and insects. We believe that the American toad is likely a very unusual prey for herons that seem to usually avoid it. The reasons for this aversion is probably due to the presence of cutaneous toxins (bufotoxins) in the toad. In fact, apart from the common garter snake (Thamnophis sirtalis) that will ingest toads whole, occasional toad predators, such as hawks, crows and raccoons consume toads by ripping out the toad’s internal tissues, thus avoiding the toxin glands on the back. Despite this aversion, this great heron probably ingested this prey because of its state of emaciation. Intoxication by consuming certain species of toad (e.g. cane toad* and Colorado River toad) is well documented in domestic animals, mainly dogs. 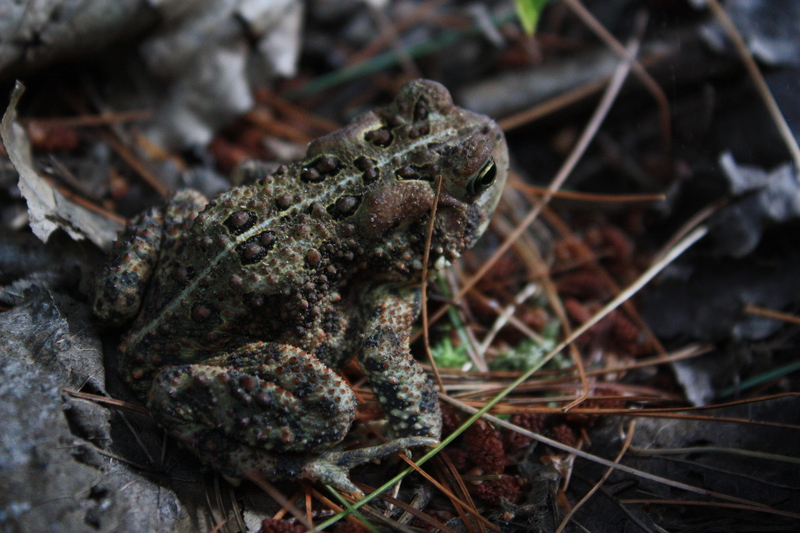 The back of the toad is covered with multiple growths that are actually glands containing toxins. The two largest glands, called parotoid glands, are located behind each eye. The poison is released when the predator applies pressure to the glands when grasping the toad in its mouth. Many active substances constitute this toxin, especially digitalis derivatives such as bufotoxins which are cardiotoxic. The clinical signs of intoxication to toad are multiple, have a very rapid onset (in the hour after intoxication) and could be quite serious. Bufotoxin intoxications have been, on the other hand, rarely documented in birds. Suspected cases of bufotoxin poisoning is limited to a case in a common buzzard (Buteo buteo). Some authors have suggested the existence of innate or acquired resistance in some birds, including species of raptors. It is hypothesized that the koilin layer covering the gizzard of raptors decreases the absorption of toxins. In addition, the toxicity of American toad appears to be relatively low; fatal cases of intoxication following the ingestion of that species of amphibian have not been properly documented. 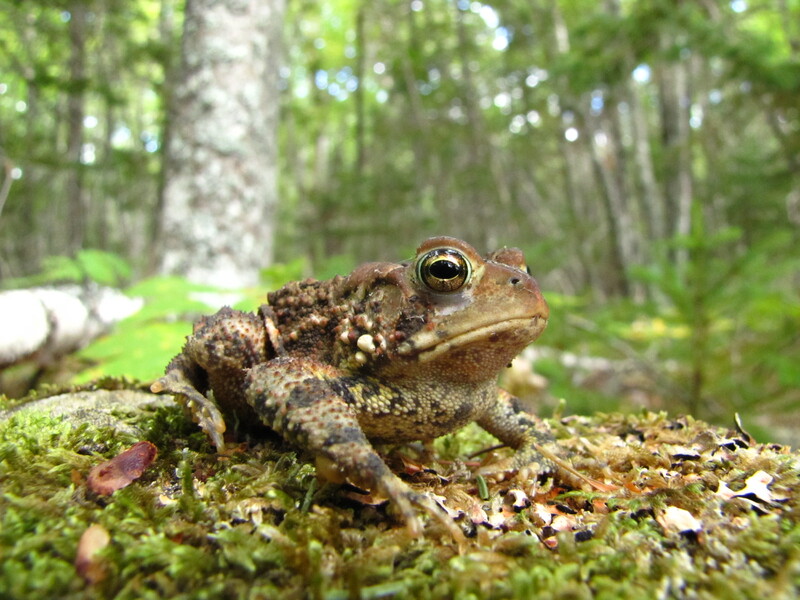 Nevertheless, American toad also produce a toxin that can cause irritation on the skin and oral mucosa and it therefore a protective mechanism against predation. In the case of this great blue heron, the toad stopped its course in the oesophagus due to the presence of vegetal debris and aquatic insects in the stomach. The fact that the oesophagus is not covered by koilin could have allowed systemic absorption of the toxins. It can therefore be proposed that the toxin secreted by the toad and likely absorb that this heron could have contributed to its death. This link between the ingestion of this toad and this mortality, however, remains speculative. Fledgling great blue heron. Photo Credit: SE Fisher. *Cane toads (Rhinella merianae), an invasive species in over 20 countries (including parts of the USA, Caribbean,and Australia), are more than 500% larger in terms of mass (229g vs 36g) and can secrete approximately 37100% more bufotoxin (dry mass: 175g vs 0.47g) relative to American toads (Chen and Chen, 1932). The relatively massive amount of toxin produced by cane toads greatly factors in to their involvement in serious poisoning cases. 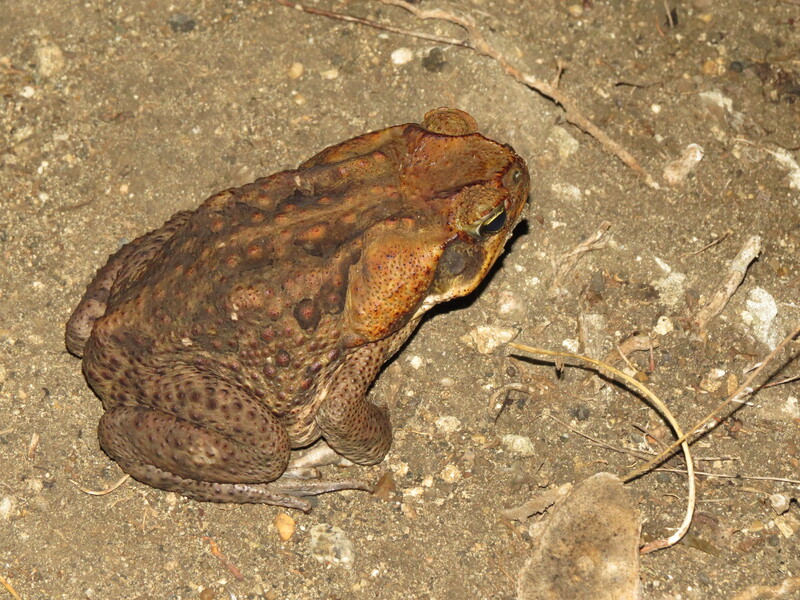 Another major factor is that species poisoned by cane toads are often naïve predators that generally lack adaptations to handle or the experience to avoid cane toads.